Blog-tember Challenge on day 8 is to do a house/apartment tour. This was a perfect reason to tidy up a bit ;) Before Greg and I got married, I lived on my own in a 1-bedroom apartment that was the quintessential girly shabby chic apartment (in my humble opinion, haha). 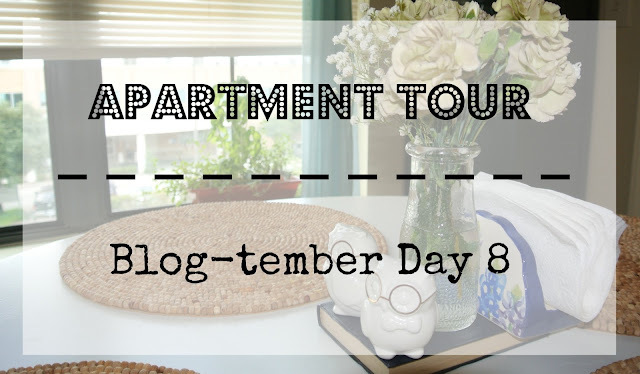 There were lots of florals, ruffles, and pastels mixed with distressed white furniture (click HERE for winter decor in my old apartment to get an idea if interested). 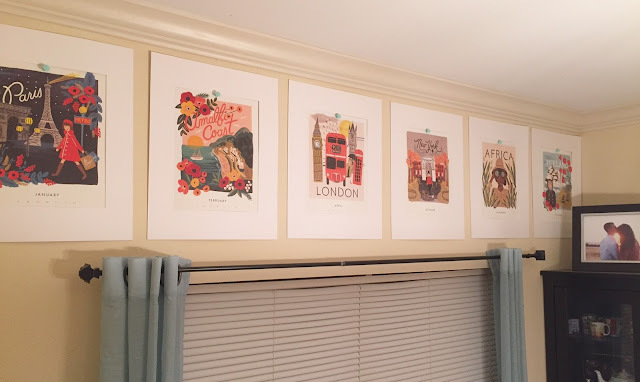 When we got engaged, we had Facetime dates where I took Greg on a tour of my apartment and asked for a thumbs-up vs thumbs-down to furniture and decor that we thought would be a balance for our future home together (since he wasn't too keen on a ultra-feminine apartment, ha). We voted for our favorite things and I sold the rest (which helped cover U-Haul for my 2,000 mile move). 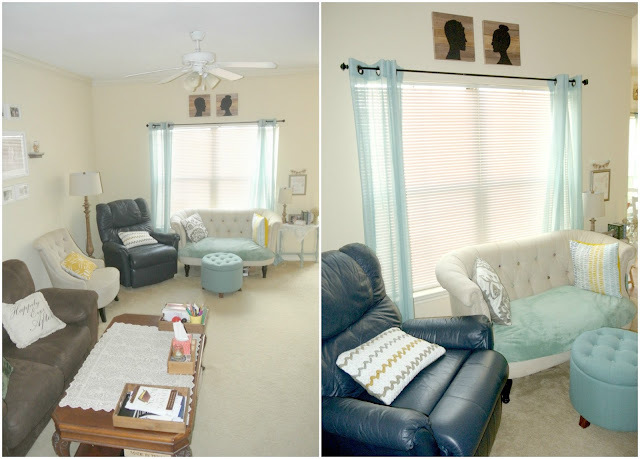 Here is our little apartment right now: A one-bedroom with a balance of neutrals mixed with seafoam blue, mustard yellow, and grey. We are pretty pleased with it because it still has a vintage + shabby appearance I love while also looking like a man could live here (Greg appreciates that, ha). We were very blessed with tons of gift cards and wedding gifts, plus we had our own furniture, so we didn't spend almost anything at all this past year on furniture and decor. Where we spend most of our waking hours reading, watching Seinfeld re-runs, working from home (Greg), studying (me), studying the Bible, journaling, and just relaxing. 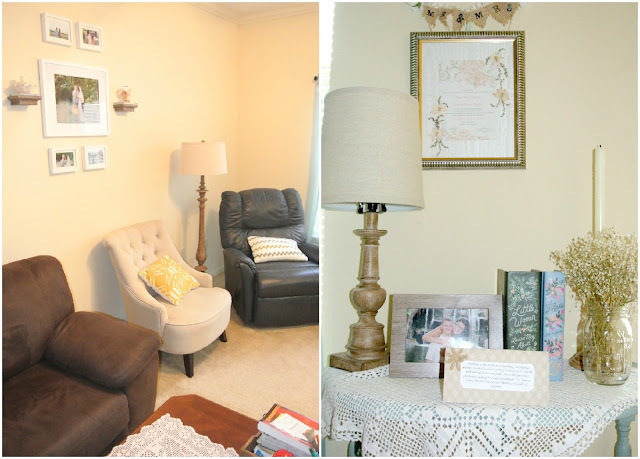 Greg kept his brown loveseat, lazy boy sofa, and large coffee table, while I brought along my adorable World Market armchair and loveseat. We recently had some water damage in our apartment and the loveseat unfortunately got some water stains, hence the aqua blanket on the seat (I made things worse recently when I tried fixing it with various tips I found online). The wooden plaques with our shadows were made by my creative sister for my bridal shower and I re-used them for the wedding and now to decorate our place. This wall collage has a story with it. I originally wanted more wooden shelves and photos to be hung but while drilling a hole for a shelf, we accidentally drilled into a water pipe, which caused a HUGE gush of water to shoot out twenty feet across the apartment, spraying just about everything in sight. There was severe water damage to our apartment, ruining various electronics and staining my favorite furniture. Luckily, we have great apartment maintenance crew (it was Memorial Day, but they were still super-quick and efficient), excellent rental insurance through USAA, and rapid access to a dehumidifier and fans so that our furniture didn't have mold or mildew growth. It was quite the ordeal. Our apartment was turned upside down for a week while everything was drying and a huge chunk of the wall had to be removed and repaired. Needless to say, no more holes in the wall for now. The little flag bunting at the top of the framed art on this little side table was our cake topper, made by my mother-in-law. The framed art was a gift from a couple of dear friends who had our wedding invitation framed with matching flowers. And the slightly-awkward pose in the framed photo was on our honeymoon when we had a free photoshoot at our resort and the photographer told us how to pose. This is the space right about the little office area built into the wall. I liked that there was extra storage/decor area up there. I love the Rifle Paper Co. yearly calendars, so I used pages from the 2014 calendar to decorate. The table and chairs were a great deal through Craigslist about 4 years ago. Our little indoor herb garden, affectionately named "Herb the herb" lives in the dining room. I have been using the peppermint, basil, and oregano for various things and hope to expand my herb repertoire soon. I collect teacups and teapots, though I sold a few before moving to Texas and have a bunch left in Oregon with family because we used teacups as part of our centerpieces at our wedding. I recieved most of them as birthday gifts from friends and family, so I am glad I have a place to display them now. I like this IKEA china cabinet for displaying some of my treasures, plus it has two shelves for storage. We sometimes bump into each other when we cook together, but otherwise it is a pretty good size. Please excuse our headboard-less bed :) I cannot decide if I want a large canvas print from our wedding or an actual headboard, so it'll stay like this until I am inspired. I love these "Prayers for my Husband" prayer cards I bought from Kristin Shmucker's online shop. They have helped me become more intentional about praying for Greg daily. They have 2-3 prayer prompts on one side and a Bible verse on the reverse. They're easily seen where I placed them since I have to use that drawer everyday, so it's a good way to remember to grab a card. I flip it to the other side once I prayed for the prompts on the card so I could stay on track. 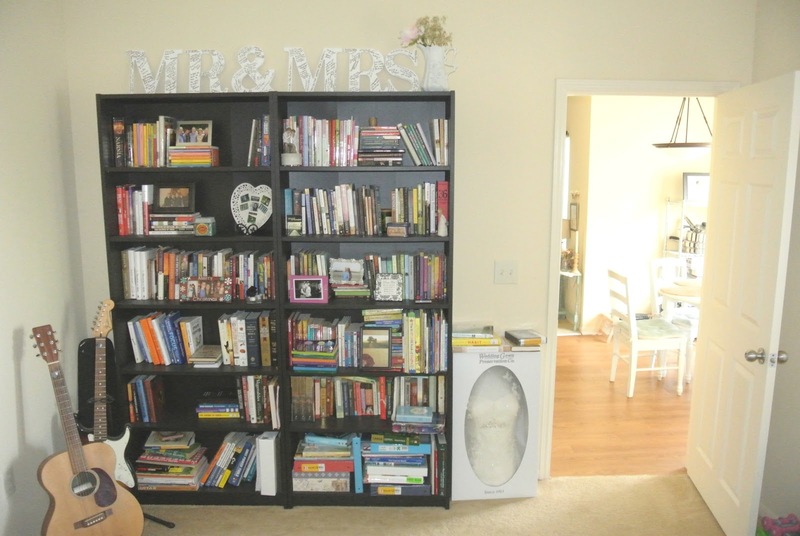 I love our IKEA bookcases we bought when we got married. Greg's books are on the left and mine are on the right, all categorized by subject. It was one of the first things we worked on once we got back from our honeymoon, because #priorities. The Mr & Mrs letters at the top were our guestbook idea for our wedding. I love seeing them displayed in our room and remembering the people who made our day so special. And, my preserved wedding dress is just hanging out near the door because I have no idea where to put it otherwise since I am out of closet space. It's become a place to hold my library books. So, there you go! I spared you the bathroom view (because there's nothing exciting there) and our deck (because it was a mess).